Tofuku-ji Temple offers opportunities for getting full experience of Zen! Since the temple is the oldest, largest in Kyoto, and easily accessible from JR Kyoto station, you will be satisfied with their attractions such as a magnificent sceneries, traditional buildings, and gardens. This places makes for a wonderful sightseeing spot in Kyoto to see first. It is the head school of Tofuku-ji of the Rinzai Sect of Zen Buddhism so that this is one of the greatest temples for people who are Zen prayers. It took 19 years before it was completed in 1236, and it was burnt twice in the middle of constructing. The temple is of a garan structure, which consists of 4 buildings: Sanmon (a huge gate of Buddhism), Hondo (main hall), Hojo (abbot’s chamber), and Kuri (office) at least. Hence, there are a lot of important cultural properties in the site. Why not visit on the first day of your trip and make it a first memorable event of your stay in Kyoto? It was rebuilt in 1425 and is the oldest sanmon in Japan. Both the statue of Buddhists, Shaka-Nyorai and Jyu-Roku Rakan are enshrined on the upper floor. It is said that sanmon is a border line between Buddha and us. Let’s try understand the history of Zen! As you pass through the entrance, the bridge will appear in front of you with an impressing view. It is the famous spot for maple leaves in autumn. You will be surrounded by red colored leaves if you are lucky. Four types of unique gardens are laid out around the Hojo building. A famous garden designer, Mirei Shigemori, created them mixing with simplicity of Zen in the Kamakura period with modern art. 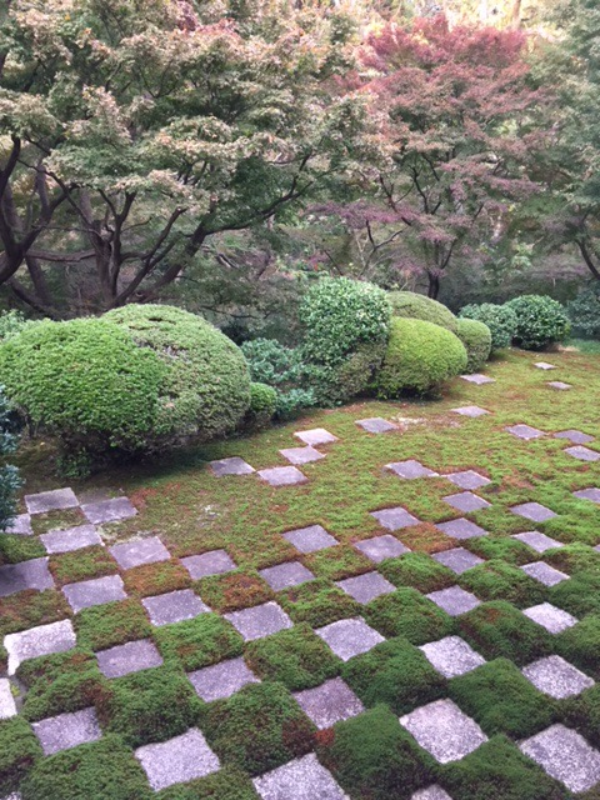 One of them called "the northern garden" has an impressive checkered Ichimatsu. Ichimatsu is a Japanese traditional pattern and used for kimonos. 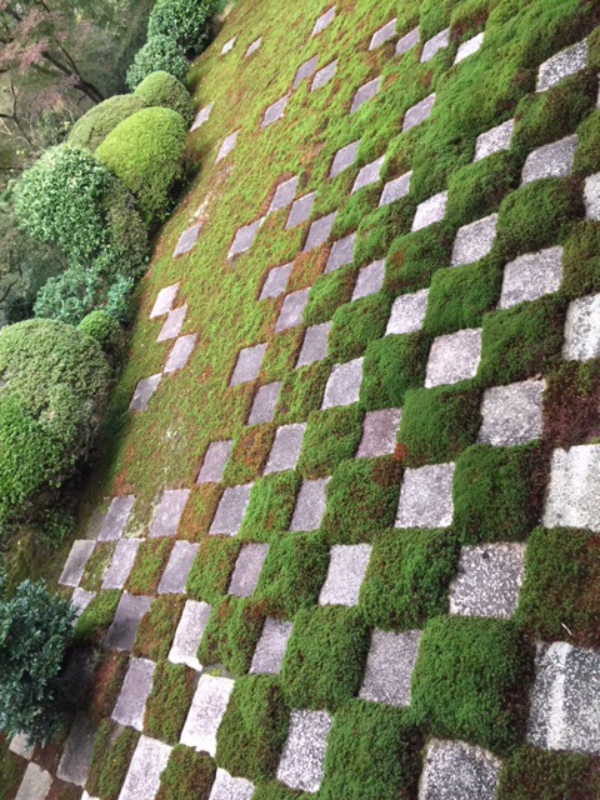 Square-cut stones are in clear contrast with brilliant green moss. 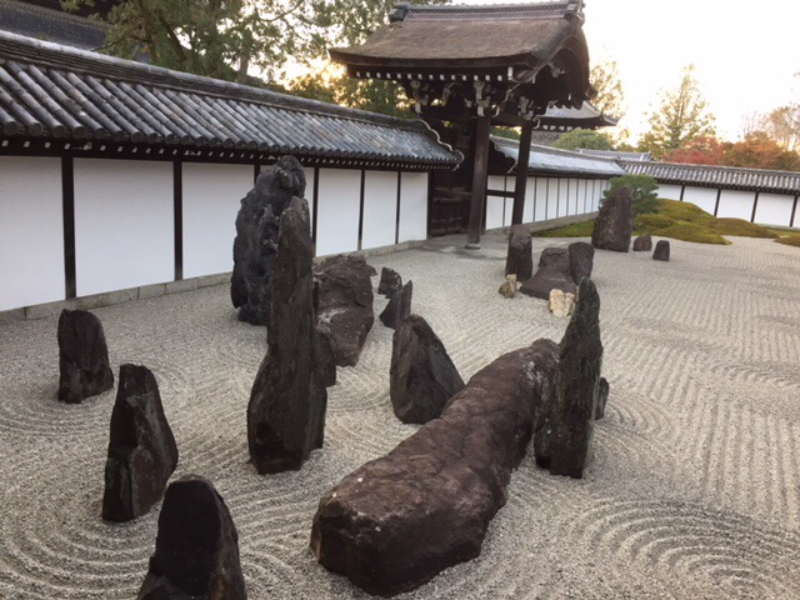 This garden expresses the Big Dipper with 7 stones and white sand that is also often used at other Zen garden (dry landscape). The stone is originally used for another place in the site. The stones are reused in this current location because one of the teachings of the Buddha explains that there is nothing to throw away. Please check out the other 2 gardens as well and see how different they are. Please do not eat anything or smoke inside the temple. The temple grounds are vast and to see everything will take at least an hour. The garden and the Tsuten-kyo Bridge both have an entrance fee but I still recommend you go to both of them! From the Tsuten-kyo Bridge you can see the autumn leaves in autumn, but the green maple leaves of May are also beautiful! Tofuku-ji Temple's Tsuten-kyo Bridge is famous a place to see the autumn leaves. Personally I would like to recommend early summer with its beautiful green maple leaves and not the autumn leaves, because during the autumn leaves season the temple can be crowded. The scene you can see from the bridge when you take in the fresh spring air is unbelievable. Beside the Tsuten-kyo Bridge the vast grounds of the temple also have the breath-taking main hall and the Sanmon Gate, and the Hojo gardens at eats, west, south, and north sides of the temple, are all worth a look, so you should prepare some time for visiting this temple. The Tofuku-ji Station of Japan Rail as well as the Keihan Electric Railway are the closest rail stations to the temple located southeast of the stations. Kyoto City Bus 6 or 16 from Shijo-Karasuma area will access to the temple. There are English brochures at the entrance of the temple which has detailed info. Since the temple is located on the next stop from JR Kyoto Station, it is very easily to access.